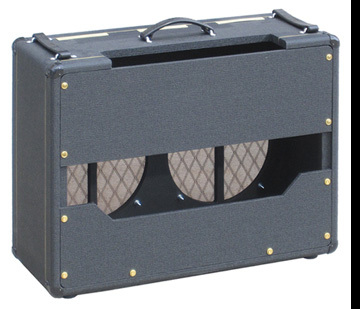 Authentic reproductions of the original JMI Vox AC-15 Twin and AC-30/4 combo enclosures, now manufactured exclusively by North Coast Music and authorized and licensed by Vox Amplification, UK. Control panel cut out: 16 1/2" x 3 1/8"
are constructed from 3/4" 13 ply baltic birch and feature gussetted half lap joinery. They are covered in authentic basket weave pattern vinhyde and offer your choice of either brown or black diamond fretcloth. Eight "one-pin" corners, three NCM-074 handles, and three brass vents are included. Slider boards are available at option. Your JMI era Vox AC-15 or AC-30/4 chassis will slide into these cabinets perfectly. This cabinet has a 16.5" wide control panel cutout that accomodates the four input JMI Vox AC-30/4 and JMI Vox AC-15 amp chassis. 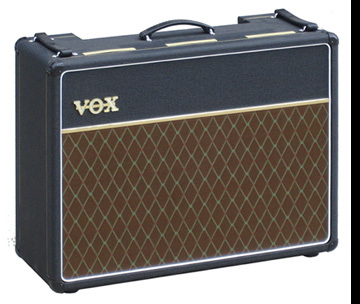 This cabinet does not fit any other era Vox AC-30 chassis, even including the JMI Vox AC-30/6 that has six inputs. If your JMI AC-30 control panel is 19.5" wide, you need the AC-30/6 combo cabinet. NCM-047 - AC-15 Twin and AC-30/4 Combo Cab - Vox grill, basket weave vinyl, three brass vents, eight "one-pin" corners, correct Vox nameplate, three NCM-074 handles, no speakers. 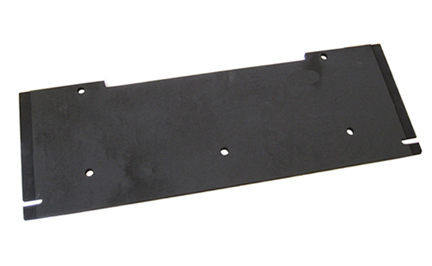 Slider boards are not included but are available below separately. 16.5" wide control panel. For JMI AC-15 and AC-30/4 chassis only. These do not fit any other era Vox AC-15 or AC-30 chassis. No electronics are included or offered by North Coast Music for these cabinets, you must supply the electronics. Sales final, no returns, exchanges or refunds. Continental US sales only. Allow several weeks for delivery. NCM-047TB - AC-15 Twin and AC-30/4 Combo Cab with a rectangular Top Boost Hole in Upper Back - Same as above but adds a hole in the upper rear back panel to accommodate 'add-on" Top Boost controls. Continental US sales only.